This is a gorgeous wrap or big shawl hand felted in the softest merino wool. I call it "scraps" because I wanted to give the idea that I had put together bits and pieces of felt to make a new big piece. 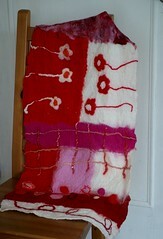 In fact, I worked on each individual piece and later put it all together, hand felting it. Gorgeous rich reds, pinks and oranges on a white base. Silk, bamboo, linen, hand dyed and hand spun yarn. Soft, light and warm.